The IT Krew: What is a Supercomputer? Super computers are extremely power digital computers that perform at a high speed. 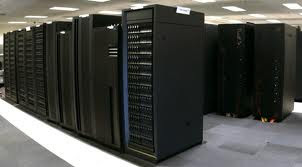 Supercomputers are used primarily for scientific and engineering work. Unlike conventional computers, they usually have more than one CPU. Supercomputers, just like any other typical computer, have two basic parts. The first one is the CPU which executes the commands it needs to do. The other one is the memory which stores data. The only difference between a normal computer and supercomputers is that supercomputers open at faster speeds than standard computers. This length of time determines the exact speed that a CPU can work.